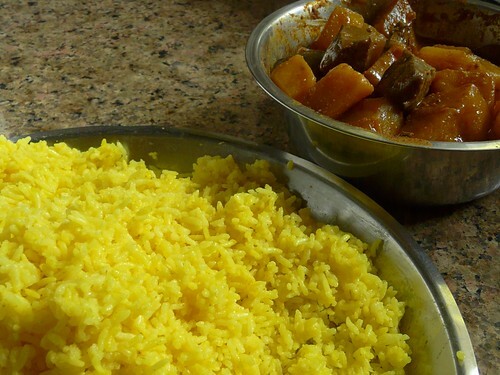 Kashmiri, Potatoes, Rice, Traditions and Customs, Under 30 min! Kashmiri Pandits, just like Bengali Brahmins, are known for their love of mutton and fish. Just the sight of a goat can make my Bengali professor salivate. Likewise, a Kashmiri is within her rights to discount a meal that did not include meat. Food is perhaps amongst the most gossiped topics in the Kashmiri community. The usual greetings and hugging are always followed by queries regarding the last meal. How do you do? What did you have for lunch? The aunt will barely keep herself from clucking if you omit to mention some meat dish, real or imaginary, in your previous repast. And you had better include the leftover morsel from yesterday’s meal while you are recounting the feast which is obviously your norm. You can see the mental balancing underway as the relative from one side (paternal or maternal) weighs the meal in question (enjoyed at the other side) and determines who the winner would be after they are done serving you next. I have been accosted on the street – and after the pleasantries were done with – “Ah, on your way from your maasi’s eh? So, what did you eat? !” Now I look back at it with nostalgia; it did make our once-upon-a-time annual summer visits to Srinagar all the more colourful. Yet, this blog speaks little of my nonvegetarian heritage. 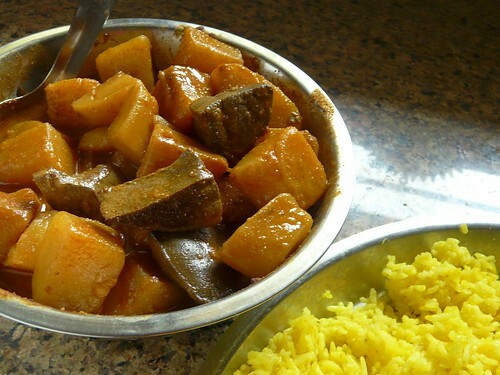 While we do have our revered vegetarian Goddess Kheer Bhavani (a prerequisite for visiting whose shrine is that we take a ‘head-bath’ to wash away the sins of meat consumption), we also have another beloved Goddess to whom we offer a prasad of tcharvan-olu (liver and potatoes) over taher (yellow rice). One for everyone. Or maybe, one for every occasion? Hari Parbat (The Hari Hill) is abode to Srinagar city’s patron deity, the Mother Goddess Sharika, represented in Hindu symbolism and Tantric mysticism by the Sri Chakra. The Goddess, known by other names such as Tripura Sundari in other parts of the country, symbolises the lofty spiritual and philosophic aspect of Shakti (the Feminine), unlike her awe-inspiring Kali rupa. Adshad-navum (the ninth day of the month of Ashad) is celebrated as the birthday of Goddess Sharika and devotees at her shrine distribute taher-charvun. Kashmiri Pandits celebrate their own birthdays in similar fashion – a tradition that I gladly follow. While those of you born on the 29th of February are happy to celebrate once every four years, in my family we get two birthdays each, every year! Since all of us now follow the Gregorian calendar for mundane reasons, and it is after all, our recorded date of birth for all things official, we observe this day as our birthday for all friends and acquaintances. For family, we keep aside the day according to the Hindu lunisolar calendar. The menu remains the same – taher and tcharvun-olu. For the vegetarians there might be a dish of tchaman-kaliya (a wonderfully fragrant and subtly spiced dish of paneer in a milky broth), and if they insist, then another dish of olu without tcharvun. On these special days the son and I partake of this meal for breakfast, lunch, and dinner. Birthdays are celebrated in this fashion not just for the family members but also for members of the extended family no longer living with you! So my mum cooks taher on my birthday, and the birthdays of my sisters, our husbands, her brothers-in-law….! More taher –tcharvun for everyone! If you care for liver, then this is a great recipe that is quick. The ideal combination is, of course, tahar. But if you are a vegetarian, or don’t think goat liver is anything to write home about, then follow the recipe omitting liver. You will have a quick version of Kashmiri dum aloo, the next best thing to serve with tahar on your birthday. Heat oil in a pan or pressure cooker. Drop in the cloves followed by the tejpatta. Once the cloves have plumped up (a few seconds) add the liver pieces and stir around till they change colour. Add the potatoes and saute for a few more minutes. Take all the spices, except garam masala, in a bowl. Add just enough water to make a paste. Add this paste to the pan and stir to fry the spices till fragrant (a minute). Add salt, and a cup and a half of water. Close the lid of the cooker and cook for 10 minutes after full pressure is attained (or cover the pan and simmer till potatoes are tender). Sprinkle with garam masala and remove to a serving dish. Serve with taher or with steamed white rice. Add turmeric to rice and steam/cook rice as usual. I soak it for 15 minutes, bring to boil, cover and simmer 10 minutes, and then let it rest another 10 minutes. Fluff it with a fork or spread on a big platter or thali. In a heavy pan heat mustard oil till smoking (I use my big iron ladle for this and other quick tempering needs). Pour over the rice. Sprinkle with salt and mix. Serve with a fiery tcharvan-olu. It is great to hand-mould into sausage shapes and eat on its own too! Used to eat liver frequently when my Gran was still cooking. Eat it maybe once a year or less now! Came over to tell you that Raaga passed on your recommendation about the masala store at INA market and I had a pleasant few minutes poking around and buying some stuff there! I wish we could have met up there… I hope you found what you were looking for, and also what you were not! Whose birthday did I miss now? Belated wishes if I did. I will try this minus the liver 🙂 looks totally comforting. Well it was like this – I couldn’t get to it for the last two birthdays… so finally made it on our anniversary! My Bengali taste buds are indeed salivating! Yummy! Ummmm… and let’s have your recipe soon! You must get to hear about the seasonal bounty in return! Mustard oil is the preferred cooking medium for most of North India, and we love the flavour which really stands out when used for finishing any dish. Anita, the types of dishes somebody serves does speak volumes of the person in question. Who knew goddesses loved potatoes with liver but I just love the sight of it. You are right – we project our tastes on to our Gods and Goddesses! 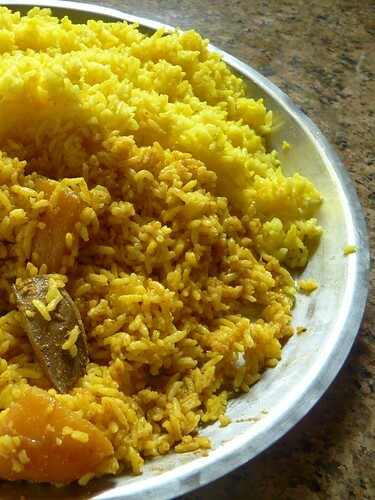 Beautiful rice…and since you now have me hooked on mustard oil I’d best try it! Could livers de murgh be used instead do you think? Yes, I suppose chicken livers should be a good enough substitute – maybe even better than those of lamb…And what a flavour liver lends the potatoes! Anita before I started reading the post I salivated thinking what a lovely looking pickle! Then it was OMG! I’ll do the minus liver olu. 😆 Yes, sans liver for you! Love the colour of the rice. It is so bright and cheery and contrasts beautifully with the red curry. Kashmiri Pandits seem to be the last of the Hindus who remain true to the history of Indian food – where meat is allowed as prasad. And, whatever happened to your army? 150g of liver for breakfast, lunch and dinner? That, too, for two?! No wonder the poor lad is losing weight! Try it without… and then try it with too! Mutton Liver… yum… Never had liver with potatoes! Loved reading about the non-veg part of Kashmiri heritage. I was watching Bizarre Food on Travel Channel the other day. In that episode, Rohit Bal hosted a 36 course Kashmiri feast (Wazwan?) for Andrew Zimmern. There were so many mutton dishes using different body parts of the lamb, I was really surprised to see the variety. Have you ever had the 36 course feast? That has to be an experience of a lifetime! Yes, the sign of a true-blue non-veg community is the incorporation of all the bits and pieces (organs and meats) of the animal – only fair if you have killed it for food. I have eaten brain, intestines, liver, kidneys…my cousin’s husband was educating me the other day about recips using other parts – I was mighty impressed. yum yum yum….i am majorly salivating! Since we have vegetarian birthdays, we replace the meat with Chaaman(Paneer). Mom says tahar is our birthday cake. “It is great to hand-mould into sausage shapes and eat on its own too!” — So true, don’t know how come but I have to eat it like this to truly relish it!! Why, oh, why are you vegetarian on birthdays?! It is our tradition – change back if you can! Aren’t those delicious?! Such a simple thing but it is the associated memories that make it special. Your pictures make me drool Anita! I recently watched a show on Travel channel where the presenter (Andrew Zimmerman, I think) of the show attends a Wazwan hosted by Rohit Bal. All those goat-meat dishes ensured I was drooling the whole time! How do I get an invitation to a Wazwan? I tried your Boorani a while ago – meant to tell you how wonderful it tasted. Never got around to leaving a comment here. Thanks for the recipe. Glad you enjoyed boorani – makes a great pairing with Hyderabado qabooli. Just saw Sig’s comment – we are talking about the same show! Come on over Anita. Surprise! Surprise! Wow – you made it already! Yum!!! This just brought back memories. It’s been so long since I’ve had this. We used to make dum aloo and yellow chaamen with taher 🙂 . Thanks for posting. Psst, Pel! Where are ya? Methinks this post is fair game now. Not taking the bait…He’s busy preserving! Lovely read this post.But not too sure whether I would cook liver.Maybe I should give it a go since a number of your other recipes were hits at home.Oh well I shall make it,at least the boys will have it.I can’t bring myself to eat liver! Yes, make it! You just might like it yourself! 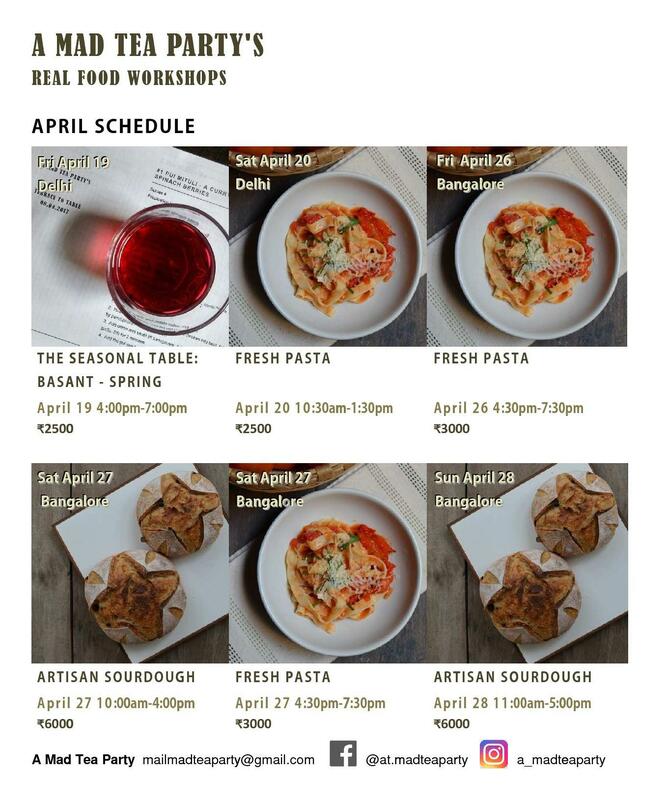 I think most (if not all) communities in India are very foodcentric. Every celebration (even death anniversaries) has its own prescribed food tradition! And yes, each member of our family also celebrates 2 birthdays a year. Great fun. Like Manisha says, get hold of an Indian astrologer. You will need to give the date, time, and place of birth. There are some that do basic charts off a computer – and you shall have your lunar birthday! …better with the liver or as long as they have been cooked together! You had to have three, of course. I hope you have fixed your oversight by now… 😀 The mustard flavour will grow on you – on all foodies, I assure you! God’s food? i didn’t know this! if the gods loved it, i bet we would too. belated birthday wishes. during my heavily carnivorous days, i took to every part of the animal except liver. i have some mustard oil with taher written all over it. will make it the next time i cook rice (which may be next week). Liver is definitely a strong tasting organ-meat but I have always liked the taste as well as the texture. 3?! Now that’s greedy… 🙂 I’d be happy with just two. Which of you qualifies as a Vedic astrologer? And you have to hold my birthday in the utmost confidence, you understand; can’t have that sort of thing leaking out! Tried the mutsch with turkey to test drive before Thanksgiving … it turned out to be so fabulous that it makes me extremely sad I have to wait for next week. It is going to be one of my treasured recipes, thank you so very much, Anita! Ha ha… you are feeling exactly like my son does about the wait for mutsch – sad! I am so happy that my mom’s recipe has found so many happy homes – I will let her know! I have some software that I could try to use. So your year of birth is what? 1954? …then you didn’t gain all that much by that third birthday – just in and out of school at a younger age, that’s all. It’s very, very, very good! At first I was trying to decide if I was eating liver with potatoes or potatoes with liver, but then finally decided that I was eating potatoes. (BTW, I seem to have missed my cue: yet another potato dish?!) The liver is acting very much like a spice, and moreso as it sits! I like that. I normally avoid liver dishes, but in here it’s just “one of the gang” and therefore it is now my favorite liver dish. 😀 Yeah, the vegetarians can make it without, but unfortunately they miss part of the story. And since I’d been eating legumes for many weeks, I truly deserved a dish like this for my good behavior- thanks for sharing! Yes, it is more potatoes with liver than the other way around… The son is not too much a fan of liver but loves the flavour it imparts to the potatoes. Of course, he’s made to eat a few pieces in the bargain. So you like! And now imagine it cooked with mustard oil – even better! I also like quick stir fried liver with onions and tomatoes (sliced and fried a little before adding liver, and spiced lightly with cumin, coriander, and cayenne) – yum with plain paranthas for a good breakfast! Welcome to The Mad Party, Shillu! Having lived most of my life in Mumbai, when I moved to Chennai I was shocked to learn that Diwali in the villages is celebrated by slaughtering a goat and having all parts in different dishes – biryani, paya, soup, rasam , curry – everything. So much for “vegetarian South Indians” 🙂 I complained to my Mom that in all her tales of the good old days in the village, she never mentioned this to me. OOOH – in Tamil Nadu as well! Make the rice! “Just the sight of a goat can make a Bengali….” that was really really funny. Liver with potatoes – never heard of em. Though I love liver, but only chicken liver…. I used to eat goat liver lonnnng time back. with every goat curry, there had to be goat liver!! memories came back. May be I should go & get some ….. Yes, you should – for more recent memories…. 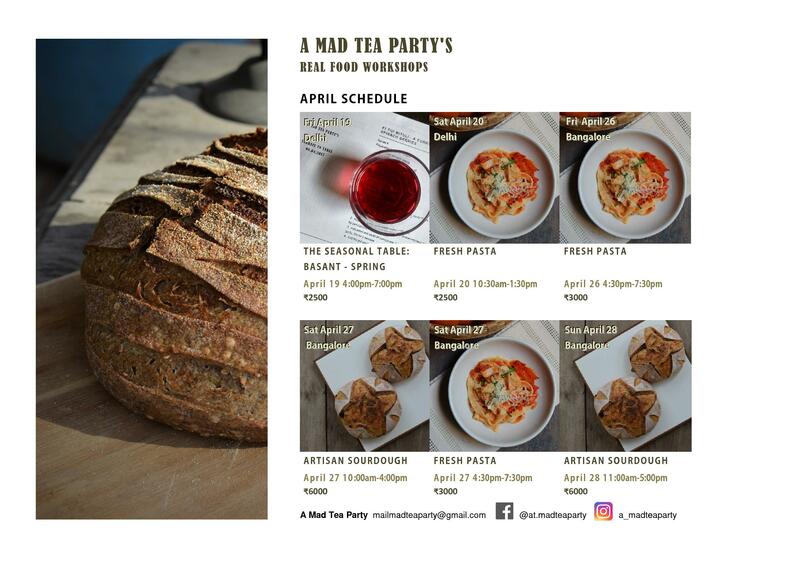 First time here….ur template looks gud and soa re the recipes! Hello! i tried taher with dum aloo.. simple and comforting 🙂 already made thrice in 2 days 😀 thanks!